What’s important as a guitarist? Good tone? Great style? Comfort? If you answered yes to any of these – especially the last one – then the WCG55CE Comfort from Washburn may be the answer to your prayers! However, with no solid wood used in the body, and a sub-$1,000 price tag, how much value for money does it actually offer? As the name instantly reveals, this guitar has been designed for comfort, whether standing or sitting. Incorporating an arm rest into an acoustic guitar is nothing new, but Washburn have used their knowhow to add a wonderful bevel onto the lower bout. The result? A comfortable playing experience that allows you to relax, no matter how long you play. Comfort aside, this is a beautiful guitar with a real rustic design – like something you’d find in an old saloon! With a Grand Auditorium body size, the WCG55CE features laminated koa on the top, back and sides. You may have expected solid wood at this price, but it’s not been offered on this model. A shame, but some compromises have to be made. The woody theme is broken up nicely by some exquisite detailing, such as the Parquet-style rosette, made using alternating maple and mahogany, the binding (also mahogany/maple), as well as the aforementioned armrest. As for the neck, this matches the body in its style and comfort. 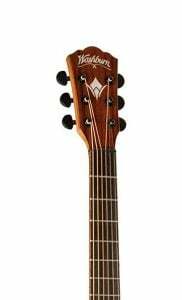 Made from mahogany, it features a slick satin finish with a rosewood fretboard and 20 frets with no inlays, which actually offers quite a high-end look. Playability-wise, this is gorgeous – a smooth satin finish and a luxury hand feel. Washburn cuts no corners with the electronics fitted to this guitar, loading it with a Fishman Presys+ 501T, which is a hugely versatile pickup/preamp system. The control panel on the top bout features a plethora of knobs to shape your sound as you like it directly from the guitar. In addition to the built-in tuner, controls include 3-band EQ, as well as notch, mic blend and phase controls. On the headstock, the set of black sealed tuning machines catches the eye, while the 18:1 gear ratio ensures precise operation. The tuning stability and tonal consistency are complemented by an ovangkol bridge, with a black NuBone nut and saddle. Solid. A lot of emphasis has been put on the comfort and style of this model, but it comes at no cost to the sound – the WCG55CE offers a top-notch tone. The quality craftsmanship and the all-koa build lead to a balanced tone leaning to the side of warmth. Sure, it’s not solid wood, and it lacks a bit of complexity because of it, but for an all-laminated guitar it really sings. The Grand Auditorium body delivers that great ‘all-rounder’ tone, performing well for everything from rock to folk, strumming to fingerstyle. This is nicely amplified through the quality Fishman pickup, with an accurate replication of the natural tone. 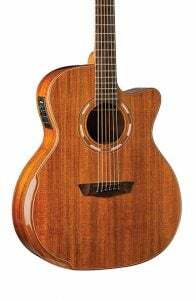 Paying over $700 for an all-laminate guitar may not be everybody’s idea of a good purchase, but the value in this acoustic is really in the style and comfort it offers. It helps that it also sounds delightful and is one of the more versatile sub-$1,000 acoustics we have reviewed. For stage performers who play away for hours at a time, the Washburn WCG55CE Comfort is a great consideration. For more info about the Washburn WCG55CE Comfort, click here. 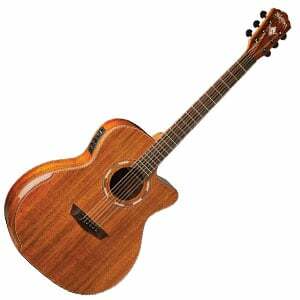 For more acoustic guitars under $1,000, click here.